Provisions that would help improve school security measures as well as ensure that required criminal and mental health records are submitted to the gun background check system were included in the Senate's omnibus legislation on Wednesday. The Fix NICS Act and the STOP School Violence Act were both among the proposals to be added to the package of bills. Fix NICS would provide millions in funding for federal agencies and states to add all of the criminal and mental health records to the National Instant Criminal Background Check System (NICS) that are required under current law. It passed the House of Representatives after being combined with another bill that would've made states honor each other's gun-carry permits, though that bill does not appear in the omnibus. The president's embrace of gun-control initiatives during a televised meeting with lawmakers had cast doubt on the bill's potential until the president later unveiled his plan to combat school shootings, which included Fix NICS. The STOP School Violence Act would provide millions of dollars in grants to train teachers and school personnel to recognize warning signs of school violence and how to step in to prevent it as well as grants for more advanced door locks and other security measures. It has been pushed by senators Orin Hatch (R., Utah), Marco Rubio (R., Fla.), and Chris Murphy (D., Conn.) as well as Parkland survivor Kyle Kashuv. Last week, the House passed it with near-unanimous support. Hatch said the STOP School Violence Act, while only a first step to dealing with school shootings and other violence, will save lives. 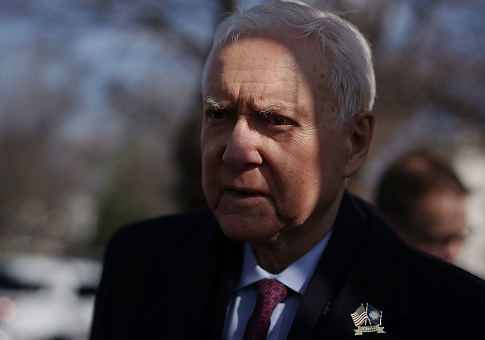 "Over the past few weeks, we've worked closely with families from Sandy Hook and Parkland, along with a number of other key groups, to advance the STOP School Violence Act," Hatch said in a statement. "This historic, bipartisan proposal extends critical, lifesaving resources to schools to keep our students safe from harm. I'm deeply grateful to members in both parties who have worked with me to get this bill included in the omnibus. While my legislation is just a first step and not a perfect solution, we know it will save lives." Matt Whitlock, Hatch's communications director, said the inclusion of the STOP School Violence Act was something that Hatch put a great deal of effort into and something that should be viewed as part of the senator's legacy. "Senator Hatch and his team have made hundreds of calls over the last three weeks to move this critical bill forward, working with leadership to get it in and to iron out details for a compromise that would fit in the omnibus," he told the Washington Free Beacon shortly after the bill was posted online. "For the last omnibus of his 42 years of Senate service he wanted to make a real difference, and this will." The omnibus is expected to be voted on as early as Thursday. This entry was posted in Issues and tagged Congress, Government Spending, Guns, New Gun Laws, Orrin Hatch. Bookmark the permalink.